I think all the 200 poems in Australian Love Poems 2013 are exquisite and, like exotic and familiar lovers, each seduces the reader in its own way. But, since I am one of the poets in the book, I am not going to review this anthology. I would, however, like to join the growing conversation about it. Editor Mark Tredinnick states that the hope for this book was “not only that it is a readable and brilliant book of poetry, but that the love will help spread the poetry far beyond poetry’s borders”. Peter Keneally from the Australian Book Review (ABR) refers to this as an “outbreak of wishful thinking”. But why he notes this as a “minor annoyance” of the book I’m not sure, for what truly wonderful thing was ever achieved without wishful thinking? Recently, I saw an article in the New Scientist, which suggested that reading literary fiction might actually help make people nicer by enhancing their ability to empathise with others. If this is true, then the idea that love could be used to spread poetry and that poetry, in turn, could spread love, seems not just possible, but something it would be nice—perhaps wise—to wish for. The reviews of Australian Love Poems 2013 published so far—one in the Sydney Morning Herald (SMH) and another in the ABR—contradict each other to the extent that it’s hard to believe they are discussing the same book. Poet and Griffith University creative writing lecturer Anthony Lawrence wrote in the SMH review that most of the poems are “linear, subject-driven, predictable and one-dimensional”, lamenting, “I wish Tredinnick had accepted more poetry that not only reflects a wide-range of forms, but poems that change and challenge rather than reinforce stereotypical ways of considering amatory or devotional love.” Whereas, in the ABR, freelance editor, writer, reviewer and poet Peter Keneally states that “the use of different verse forms constantly surprises, and hardly ever goes astray or becomes heavy-footed”, “the array of contexts and metaphors for love is endless”, and, despite knowing that all the poems are about love, “Exactly what aspect of love a given poem sees, and from which cultural or personal slant, takes longer to divine”. Keneally says the book is “fabulously various” and that “Tredinnick deserves great credit for this”. Lawrence claims many of the poems are “overburdened by sentimental language and cliché” bringing to mind that kind of icky, over-the-top romance that Australians love to hate. Sentimentality has never been well tolerated in our culture, and it’s even less fashionable in contemporary Australian poetry, where the modernist tradition is to avoid the expression of emotion at all. However, Keneally says that “because poets take poetry (and/or love and/or themselves) entirely seriously, it’s not a romantic collection, but moves with a deliberate, antique passion”. Could it be, we are so much on the guard against sentimentality, that we can no longer appreciate the presence of sentiment? These are mixed reviews. And while each has its critique, one exhibits clear enthusiasm and admiration for the project, while the other doggedly disapproves of it. Luckily, both reviews have served to pique buyers’ interest and put a spotlight on love and Australian poetry, which is surely a good thing in anyone’s book. Still, who’d have thought that this book, the first publication from Australia’s newest press Inkerman & Blunt, could cause such contradiction? And how did a book like this, a book full of poetry and love, ever manage to offend anyone, least of all a poet of Lawrence’s stature? I guess if anything is going to make people act irrationally, it’s love. As Tredinnick notes in his introduction, “Love has many minds and moods, and not all of them are kind”. “Who’s writing the love” in Australian poetry? This is the question Gregory Day posed to editor Mark Tredinnick back in 2010 at the Perth Writers Festival. When Inkerman & Blunt put out the call for submissions to Australian Love Poems 2013 on 19 February this year, nearly 640 poets across the country answered that question, submitting 1,501 poems. The question now though, is “Where’s the love” in Australian poetry? That, at least, is what I’d like to know. While Lawrence names his 10 favourite poems and poets, he doesn’t name the poems or poets that he finds particularly disappointing. I can understand his hesitation to do so, given the high profiles of many of the poets Lawrence is insulting when he lists examples of lines that he feels are either “overburdened by sentimental language and cliché, or which use complacent, obvious imagery and rhyme”. One of these poets is Luke Davies, who has not only won The Age Book of the Year Award for poetry, but the Prime Minister’s Literary Award for poetry as well. Lawrence disparages the following line from Davies’ poem Gabrielle’s Skirt-Dervish Issues: ‘Wear them always/pristine clean, said well-intentioned mother:/and fear the bus that runs unclean girls down.’ Such criticism is invalid though, because this line can’t be considered obvious or clichéd, since it is a poignant play on—indeed, a re-imagination and undermining of—a clichéd expression in order to expose the violent and sexist ideas underpinning our patriarchal society. I believe this very line to be one of many brilliant moments in the book. It is more than a little disrespectful to imply that the “majority” of poems in this book, from so many of our celebrated poets, are not worthy of “serious attention”, and likewise to suggest that Mark Tredinnick—an internationally celebrated poet of profound calibre and experience—could compile an anthology of substandard poetry. There is merit in many more of these poems than such a loveless review suggests. Apparently, some people who submitted to the anthology were upset because they weren’t included. Many agreed with Lawrence, who implied that the submission period of 57 days was not long enough, despite the fact that it was actually 70 days. He also suggested that the majority of the poems were hastily written during this time and lacked “serious revision”. “How many poets just happen to have a love poem languishing in a file or desk drawer?” he asks in his review, and then answers, “Very few”. However, I suspect that, on the contrary, most poets’ desk drawers and computer files contain a plethora of unpublished poems in want of a good home. Some poets complained, along with Lawrence, that because the project only sought previously unpublished poems, “a number of wonderful (some recently published) love poems missed out on a potentially wide readership.”** But surely it’s a cause for celebration, not complaint, to see a publisher encouraging and investing in new work. Still others were upset when the payment per poem was reduced because the publisher opted to spread the love even further, by boldly doubling the scope and production costs of the book in order to publish 200 poems rather than 100, all the while knowing full well that poetry doesn’t sell. It’s disheartening to see such a gesture of love—indeed, a project of “generosity, intelligence and beauty”, as Tredinnick describes it—sparking such petty responses, with little love discernible for a new publisher, for one’s fellow poets, and certainly not enough love for poetry. Ultimately, the average Australian reader is not very impressed by, or interested in, all this seriousness. As Tredinnick observes, “There has been a good deal more head than heart in Australian poetry for a while, a good deal more mind than body, more wit than wisdom”. Intellectual elitism might have its place in academia, but not in a book whose goal is to widen the readership, appeal and profile of Australian poetry through the universality of love. Love isn’t academic. And the effect a person or a poem has on you is rarely logical. The fact that one poem touches you deeply, while another leaves you cold, has more to do with chemistry than literary techniques. Sometimes you can’t say why a certain poem delights you; it just does. Different things turn us on—in poetry and in love. Tredinnick knows this. “Love asks you to choose, so I chose,” he says. “I know I’ve left many fine poems out—some that were, no doubt, a little too good for me. And I know I’ve fallen for one or two that are unlikely to do me any good”. Such is the nature of love. To fall for a person, or a poem, is to make oneself vulnerable. To write a love poem is to expose oneself to criticism and rejection. But to publish an anthology of love poems in this country in the current publishing climate—well, that’s just wishful thinking. And I, for one, wish there were more of it. 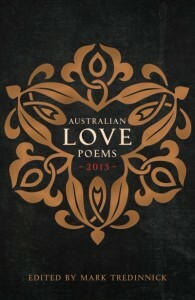 Australian Love Poems 2013 is published by Inkerman & Blunt. Submissions are now open for Australian Love Stories 2014, edited by Cate Kennedy, and listen out for news of Australian Love Letters 2015, which will complete this Australian series on love. * I recommend Tredinnick’s introduction to Award Winning Australian Writing 2012, reviewed in Lip Verse last year, as one of the best introductions to a book I’ve ever read. ** This appears in the version of Lawrence’s review published in The Age. Bronwyn Lovell lives in Melbourne. Her poetry has been published in Australian Love Poems, Antipodes, Cordite Poetry Review and the Global Poetry Anthology. Bronwyn has won the Adrien Abbott Poetry Prize and been shortlisted for the Newcastle Poetry Prize, the Bridport Prize, and the Montreal International Poetry Prize. She works for Writers Victoria. Thank you Bronwyn,for defending love & Australian poets writng about love; I couldn’t agree more & congrats on your recent success. Yes Bronwyn, you have picked up on the seeming inability of some reviewers of this book to appreciate its variety and strengths. You have to wonder about people who don’t believe in love and refuse to write about it, I mean, how did they get here? One has to ask why some Australian poets shy away from writing about love, as though it doesn’t fit in with their agenda, or offends against the ideals of theory. It remains one of the great challenges of the creative act to talk about love and get it right. This alone is one reason for reading the book, to see how many different people find ways of doing it. Congratulations for picking up on the naysayers. As a poet who missed out on being selected for the anthology, of course I was disappointed, but being an “unknown” poet means I have to earn my place. That I was overlooked for this book, urges me to improve my craft. I found the book, enlightening as well as challenging. I found Lawrence’s review probably says more about his understanding of what poetry should be, rather than what the poet’s write from the very depths of their being. Criticising poet is like shooting sitting ducks, it is easy to do, it is less easy to look at the poetry from the poet’s perspective. I´m in the book, so a sitting duck, but recommend George Thomas´s review in the Nov. Quadrant. I agreed with Lawrence in part, if not in tone. Thomas says he liked about a third of the content, and `in an anthology of previously unpublished poems, a success rate of 33 per cent per reader is more than acceptable´. Overall, he says, I&B `have produced something remarkably good´ and that his `greatest pleasure came from discovering poets I had not heard of before´. It´s a fairer, more interesting, review than those Bronwyn deals with. Who is ‘Claire’ and who is she reviewing for? Lip? Hard to comment with so little credible information about the critic. Without, it sounds just like an opinion and if so why are we wasting space with it here? Opinions are noses- everyone had one. I was give this poem after I lost my job. It totally got me back on track. It’s called a magic poem because of the way the words affect people, I just think is Super Inspiring. 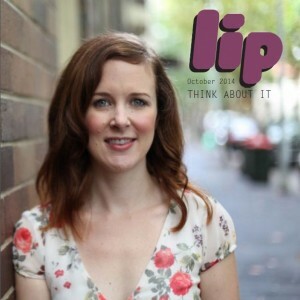 This entry was posted in Books and tagged Australian Love Poems 2013, Bronwyn Lovell, critique, Inkerman & Blunt, lip verse, love, poetry, Review. Bookmark the permalink.